"The big concern for organisers is waiting to hear if eight-time winner of the tournament Serena Williams will be fully fit when the tournament starts." Part two of the Sunshine Double begins on Tuesday when the women's singles gets under way in Miami. First staged in 1985, the Miami Open is one of four events which holds Premier Mandatory status, the highest rank after the Grand Slams and WTA Tour Finals. After three decades being played in Key Biscayne, the event has been moved approximately 20 miles north to Miami Gardens, although its date in the calendar remains the same. The big concern for organisers is waiting to hear if eight-time winner of the tournament Serena Williams will be fully fit when the tournament starts. The 37-year-old was forced to retire from her third round match at Indian Wells, explaining she was suffering from "extreme dizziness and extreme fatigue...I was not feeling at all well physically." After losing the first game of the second set, having conceded the opener 6-3, the American decided enough was enough, as Garbine Muguruza booked her spot in the next round. The defending champion is Serena's compatriot Sloane Stephens who suffered a shock defeat to qualifier Stefanie Voegele at Indian Wells. Stephens, who turns 26 during tournament week, is currently without a full-time coach and trying to assess her chances in any tournament has always been difficult. Born and raised in Florida, the Fort Lauderdale resident is more inconsistent than the majority of leading players on the WTA Tour. Bianca Andreescu: The 18-year-old Canadian is one of the rising stars of the women's game. She reached the final in Auckland earlier this year, after beating Caroline Wozniacki and Venus Williams en route. 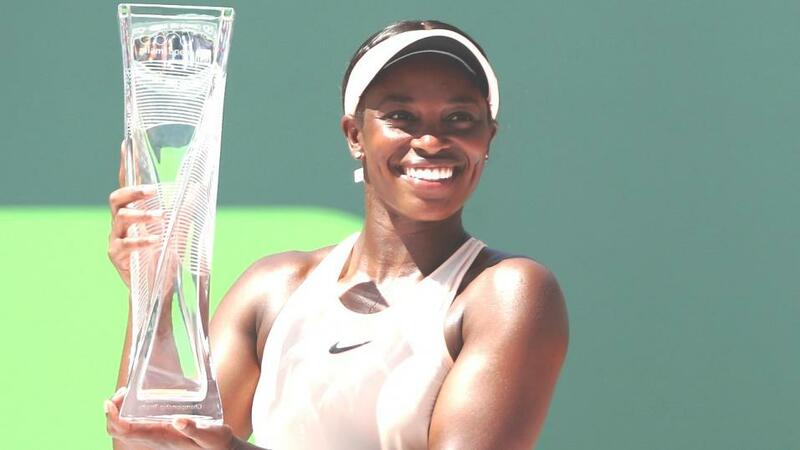 Then, at Indian Wells last week, produced the most stunning performance of her young career by winning the tournament after being handed a wild card into the event. In the space of two-and-a-half months, her world ranking has risen from 178 to 24. Belinda Bencic: Appears to be coming of age. The 22-year-old from Switzerland has long been thought of as a potential Grand Slam champion but, after reaching No 7 in the world three years ago, her career took a downward turn. She won the prestigious Canadian Open at 18, but had to wait another three-and-a-half years before she claimed her next Premier 5 level title - in Dubai last month. Currently in the form of her life, she ended Naomi Osaka's title defence at Indian Wells for the loss of just four games. However, was beaten in straight sets by Angelique Kerber in the semi-finals. Angelique Kerber: In many ways was a surprise finalist last week when losing to Andreescu. The experienced German has a reliable temperament and rarely ends up beating herself. Petra Kvitova: Has reached but lost in two big finals this year. She was beaten by Naomi Osaki at the Australian Open, before losing in three sets to Belinda Bencic in Dubai. The 29-year-old from the Czech Republic, and two-time Wimbledon champ, lost her opening match at Indian Wells but as this was against Venus Williams - who went on to reach the quarter-finals - we can forgive her for that. Maybe the unexpected rest will have done her some good as she prepares for Miami. Karolina Pliskova: Can never be ruled out on any outdoor hard court but her form in big events during the last couple of years has been littered with quarter-final and semi-final appearances. Really needs to start reaching a few more finals at this level. Elina Svitolina: Continued her strong start to 2019 by reaching the last four at Indian Wells where she lost in three sets to teenage sensation Bianca Andreescu. Was a quarter-finalist in Melbourne, and reached the last four in Dubai, having ended last year by winning the prestigious WTA Tour Finals. Aryna Sabalenka: The outstanding 20-year-old. Is hoping to follow in the footsteps of her Belarussian compatriot Victoria Azarenka who has won this title three times. Check out the prices for the women's singles in Miami.